Latest News ! 10-3-2014 - The setup has begun, but there is still much, much more to be done. Our goal is to have all our displays operating by Oct 26th. We will also post the display hours here in a future update. There will also be a collection jar available for the Dog Park in Jefferson Township fundraiser, and hope our fans will be able to help with this very good cause. Welcome to our Carafa Halloween web page! Beginning around 1990, we have celebrated this holiday with our own special flair. 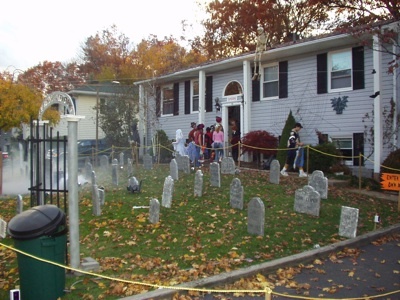 During the month of October, we begin setting up the Rock and Roll Cemetery on our front lawn. To date, we have 71 residents. From Duane Allman to Warren Zevon, and Buddy Holly to Ray Manzarek, we have chosen our favorites. There is a jukebox that plays a snippet of each musician's particular talent. This is our homage to these talented people. Our motion activated creatures come to life as the trick or treaters begin along our driveway. Dracula bolts up in his coffin if disturbed. A screeching skeleton shakes wildly from the tree. Perhaps he's frightened by the chainsaw that lunges from the corner of the house. Bring your snakebite antidote because you never know when it will pop out of the bushes. Are you brave enough to ring the doorbell? Freddie Kruger might just try to take you candy! Behind the front door, a hideous creature guards a vat of treats for all and any that make it that far. More surprises await you as you continue through the cemetery to the exit! Feel free to move around the site to explore our display!